This entry was posted on November 2, 2018 at 8:42 pm and is filed under 1980s, Concerts, Heavy Metal, Heavy Metal and the 1980s, Music, Rock, Uncategorized with tags Americans, anthrax, Cardiff, Classic Rock, hard rock, Heavy Metal, Heavy Rock, Hell Awaits, Lamb of God, Slayer, speed metal, Testament, The 1980s, Thrash Metal, Venom. You can follow any responses to this entry through the RSS 2.0 feed. You can leave a response, or trackback from your own site. Ah yes, good times. 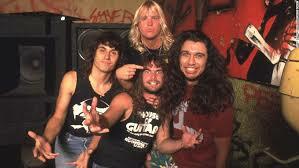 I used to love to hear TV evangelists bash bands like Slayer. Made me want to listen to them more. Kill Again is my favourite off this. Like I said, any track from this album could be someone’s favourite. Have you seen them twice before on this tour? If so, lucky you! This will be my third and a half time seeing Slayer. Twice at Bloodstock, (2013 and 16) and I saw about 20 minutes of them at Download in 2017. I wanted to get a good spot for Aerosmith on the main stage. Awesome choice! Dave Lombardo is a great drummer! I used to have fast hands like his. Age and arthritis takes it’s toll. True and don’t I know it. Great review. I love their later stuff but this was too shrill for me. They did go slightly more melodic with their later stuff but this album, while less melodic, is definitely more ferocious. It’s all a matter of preference in regards to Slayer. What a record. 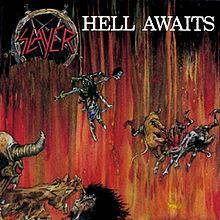 This was the first Slayer I ever heard and I wondered if it even qualified as music. Pure Evil and fascinating but was it music? It surely was. What a game changer. Still stops me in my tracks now. Lovely stuff. I think this record took music to a whole new dimension. I never doubted it was music and I loved the loud aggressiveness of it all. Thanks. I am going to have a crazy day at work before and the same tommorow so will probably have no time to arrange a propper meet, but I’ll email you a pic of my patch jacket and if you see it you we can say hi. I go the pics so I will keep an eye out for you. I’ll be wearing my brown corduroy waist coat with Dio and Anthrax patches on the back. I’ll also have a Twisted Sister bandanna around my head. I prefer their more melodic stuff. I have only heard this once and I thought my face was going to melt and demons would come out from the floor boards. I was hoping for the demons but I’m glad my face didn’t melt when I first heard this. This album is not for the feint hearted. I got this and it is awesome! Crank it! It is awesome and I do!